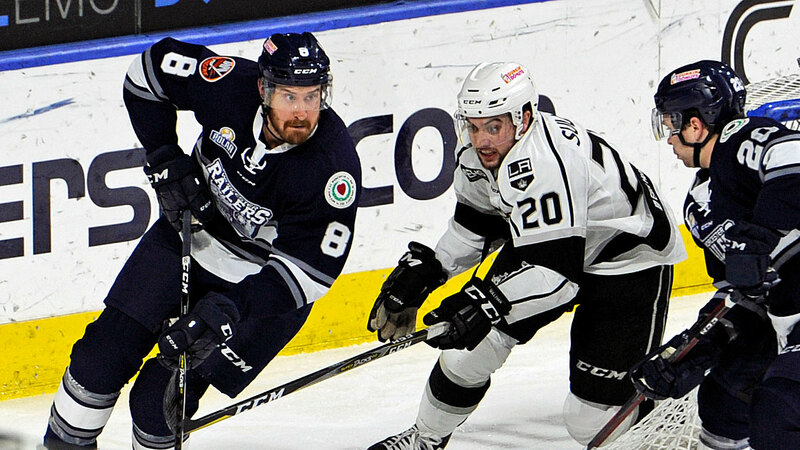 Manchester, NH – The Worcester Railers HC(24-22-5-4, 57pts)concluded their season long seven-game road trip with an exciting 4-3 overtime win over the host Manchester Monarchs(29-24-2-2,62pts) in front of 1,832 fans at the SNHU Arena on Wednesday evening.With the win, the Railers are now twopoints behind the Maine Mariners for the 4thand final playoff spot in the North Division. The Railers return home for a Sunday afternoon game vs. the Adirondack Thunder at 3pm. Nick Sorkin (1-1-2), Barry Almeida, Matty Gaudreau (1-2-3), and David Quenneville (OTG) scored for Worcester while Mitch Gillam made 33 saves in net as the Railers finished 3-2-1-1 on their seven-game road trip. Sam Kurker scored twice to lead the Monarchs offensively while goaltender Charles Williams made 40 saves in net. Worcester trailed 1-0, led 2-1, and 3-2 before David Quenneville won the game at 3:31 of overtime. Each team scored a goal in the opening 20 minutes of play as Manchester controlled the first ten minutes and the Railers grabbed the second half of the period. Sam Kurker (10th) scored on his own rebound at 9:28 to give Manchester a 1-0 lead but Nick Sorkin (11th) deflected a Rob Powers point shot at 17:01 to tie the score. Shots were 15-11 in favor of Manchester through 20 minutes. The Railers would grab 2-1 and 3-2 leads in the second period but Manchester would battle back each time. Barry Almeida (16th) scored on the power play at 4:54 to give Worcester a 2-1 lead before Kevin Dufour (21st) tied it at 10:42. Matty Gaudreau (10th) scored on a rebound at 11:34 to put the Railers ahead 3-2 before Sam Kurker (11th) scored on a rebound at 14:30 to tie the score again. Shots were 27-24 in favor of Worcester through 40 minutes of play. Neither team scored in the third period as Worcester outshot Manchester 15-8 before the game headed to overtime. In a back and forth overtime session, rookie David Quenneville (4th) skated into the zone and stick handled before sniping a shot from 40 feet top shelf at 3:31 to give Worcester a 4-3 overtime victory. Notes: Three Stars: 3rd star: Nick Sorkin (1-1-2) 2nd star: Sam Kurker (2-1-3) 1st star: David Quenneville (OTG) …. final shots were 44-36 in favor of Worcester…. Charles Williams (16-10-3) made 40 saves on 44 shots for Manchester…. Mitch Gillam (15-13-4) made 33 saves on 36 shots for Worcester….while Evan Buitenhuis served as the backup…. Worcester went 1-for-5 on the power play while Manchester went 0-for-4…. Kyle McKenzie (inj), Matt Schmalz (inj), Tommy Panico (inj), Alex Vanier (inj), Connor Doherty (inj), and Tommy Kelley did not dress for Worcester…. forward Malcolm Gould was traded to Newfoundland for future considerations on Tuesday….. Jeff Kubiak is on recall with the Bridgeport Sound Tigers…. Ryan MacKinnon, Rob Powers, Matty Gaudreau (2), Nick Sorkin, Josh Holmstrom, and Ryan Hitchcock (2) added assists for Worcester…. the Railers are now 11-14-1-3 on the road this season and finished 3-2-1-1 on their season long seven game road trip….Ryan Hitchcock now has 23 points (10-13-23) in his last 18 games….Nick Sorkin (1-3-4), David Quenneville (2-1-3), and Matty Gaudreau (2-3-5) all have three-game point streaks…Worcester is now 4-5 in overtime this season….Matty Gaudreau fired seven shots on goal and finished +3….the Railers have 7 games remaining (10 home, 7 road)…Worcester finished the month of February with a 5-4-3 record. What’s on tap – HOME…..FINALLY! The Railers return home on Sunday, March 3 with a 3pm faceoff vs. the Adirondack Thunder on a KIDS GIVEAWAY SUNDAY. The first 1,000 kids 12-and-under will receive a Railers HC jersey lunchbox courtesy of Pepsi Worcester. Score a SUNDAY FUNDAY ticket pack which includes 4 tickets and 4 beers or 4 tickets with 4 sodas and popcorns starting at just $60. Coverage begins at 2:35pm on 98.9 NASH Icon.